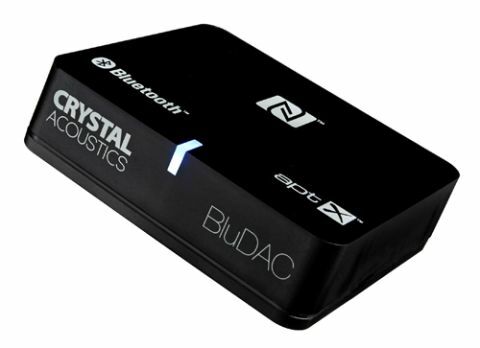 Crystal Acoustics BluDac review | What Hi-Fi? What the BluDAC lacks in size and weight, it makes up for in body art. You can see what it has to offer via its NFC, Bluetooth and aptX logos tattoos. Pairing is painless. There is no button to spark it into action – the BluDAC’s ready to be connected from the moment you plug in the mains lead. If you’re using NFC, hold your device up against the DAC’s top panel and you will get a quick handshake. The LED sat in the middle of the DAC beams a steady shade of blue. When you’re pairing over normal Bluetooth, the DAC comes up as ‘Music Receiver’ on your smartphone or tablet – the majority of rivals tend to show their actual model name to help save any confusion. Right away you’re impressed by the BluDAC’s powerful, dynamic approach to music. Play Haim’s Running If You Call My Name and the track has vigour and verve. There’s a solid soundstage in front of the listener, with plenty of headroom to allow for those punchy drum kicks and expressive vocals. The BluDAC picks out plenty of detail, including the subtle sparkle of the piano strings that follow in the background. Music doesn’t have the same level of finesse as when heard through the Arcam, but then again, the miniBlink is almost double the price. And this is what makes the BluDAC a bargain.